NEWINGTON – If you don’t get your home’s radon levels in check, your kids and pets might start worrying. Hannah Poulin, a sixth-grader at John Wallace Middle School, depicted just this in her entry to the Connecticut Department of Health’s 2018 Radon Poster Contest. Resembling a comic strip, Poulin’s poster featured a dog, a cat, and even a parakeet discussing the dangers of the odorless, colorless gas, which the U.S. surgeon general warns is the leading cause of lung cancer in non-smoking adults. Poulin’s poster won first place among 313 posters received from schools across the state. 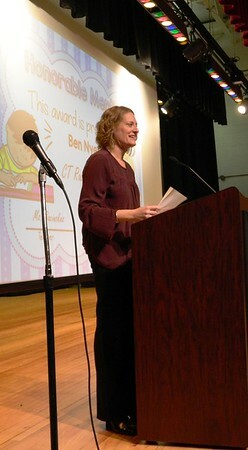 The 160-member sixth-grade class at JWMS cheered and clapped when her name was called for the award. “This isn’t only dangerous for us, but also for our pets too,” Poulin said of her idea for the poster. “I really love animals and I know a lot of other people do too so I thought it would spread more awareness,” she added. 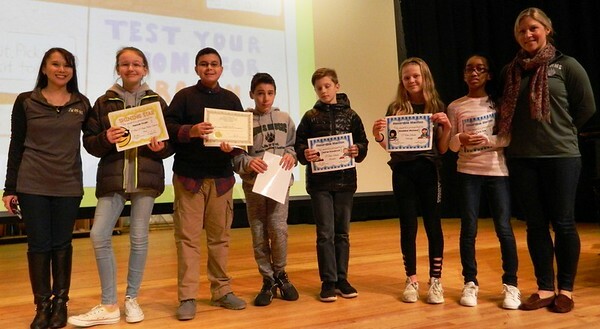 The school was one of five in Connecticut that submitted entries into this year’s contest, which was coordinated by Health Department environmental analyst Allison Sullivan. The competition was open to kids age 9 to 14 enrolled in any school or sponsoring club, such as Scouting groups and 4-H organizations. Participants were asked to choose one of five topics to explore in their poster – what is radon; where it comes from; how it enters homes; its ability to cause lung cancer, or the importance of testing. Five of Poulin’s classmates were also finalists. Alexander Jacobs won third place and honorable mentions went to Corin Tate, Madeline Michaud, Adrian Kowalczyk and Ben Nyez. The group represents six of 13 posters to be featured on the Health Department’s annual Radon Awareness Calendar. They will also be showcased in the State Capitol through 2019. Sixth-grade teachers beamed as the students walked up on stage to accept their awards. 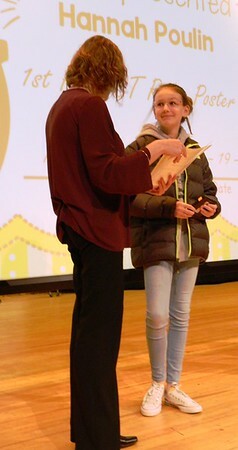 She incorporated the contest into the sixth-grade science curriculum, as a project in the body systems unit. Radon testing is easy and inexpensive. If high levels are detected, steps can be taken to fix the problem. State health officials created the poster contest because it’s a topic youngsters are excited to share with grownups. “We limit it to a group just learning about the periodic table of elements and being introduced to scientific concepts they can grasp,” Sullivan explained. 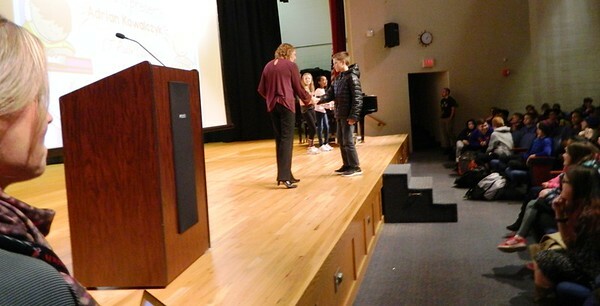 After the awards assembly, Jacobs, the third-place winner, ran after her to offer a personal thank-you. “I really appreciate this,” he said. Posted in Newington Town Crier, Newington News on Thursday, 3 January 2019 08:18. Updated: Thursday, 3 January 2019 08:20.